Lyons Truck Parts of Kenosha, Wisconsin has been a family-owned business since 1959. We are well known throughout the industry and are Southeastern Wisconsin’s largest truck transmission re-builder. Besides transmissions, Lyons Truck Parts services differentials, power dividers, and steering systems for medium to heavy-duty trucks. Our reliable and experienced service professionals understand trucks and truck repair and are dedicated to eliminating the hassle of buying truck parts and repair services. Lyons Truck Parts services a complete line of medium and heavy-duty diesel and alternative fuel engines for the commercial vehicle market. We are proud to provide professional service specialties and quick turn-around time. Our customers include fleet owners, both large and small, and individual owner operators. Besides great service repair, we also offer a complete line of medium to heavy-duty truck parts to fit your specific needs. Our company has grown through the years to accommodate our customers’ needs. Lyons Truck Parts also services coaches, motor homes, and RVs. Don’t forget to ask your sales person for our monthly parts and service specials. Stop by our convenient location in Kenosha, Wisconsin (the west frontage road of I-94, just north of the Illinois state line.) Click here for a map and directions. Expert Transmission Rebuilding (Drivetrain rebuilding has been our specialty for over 50 years). We ship all over the country and pay for your transmission core to be returned. 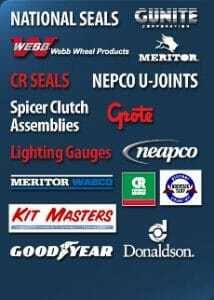 We are proud to offer competitive pricing on parts and quality services you can trust. Our goal has always been to build a relationship with our customers that is based on superior quality and dependability.